NEW YORK – Progressive ‘pastor’ Carl Lentz of New York City draws thousands of followers—including Justin Bieber—to concert-like services each week, but many Christians are concerned that he seems to be concealing his stances on moral issues, including homosexuality. 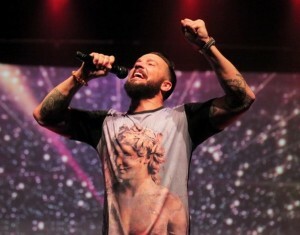 Hillsong New York City is a popular Pentacostal congregation, which meets each week in nightclubs, theaters, and other venues across New York City. Trendy concert-like music, strobe lights, and Lentz’s unconventional messages draw thousands of attendees every Sunday. In an interview last year with the Daily Mail, Lentz proudly described the “craziness” which unfolds at Hillsong NYC each weekend. Some attendees say they feel “more comfortable” in Hillsong NYC’s modern, non-traditional environment. Celebrities often stop by Hillsong NYC to experience Lentz’s unorthodox messages, which are often replete with street slang and modern lingo. Justin Bieber occasionally attends services and was reportedly baptized by Lentz last week after the young pop star came under fire for racist comments. “I’m proud of Justin Bieber,” Lentz Tweeted on Thursday. Some Bible-believing Christians say Lentz is an example of a megachurch leader who maintains lukewarm theology in order to attract maximum crowds and avoid offending anyone. As previously reported, both Rob Bell and Joel Osteen similarly refuse to speak out against homosexuality from the pulpit. Ken Silva, a Christian minister who frequently writes on issues of concern surrounding the Church, observed that sin-less sermons from megachurch leaders are increasingly common. “This is typical of the cult of celebrity megapastor because to grow their little kingdoms they cannot risk offending anyone,” Silva wrote in a Wednesday blog post. Silva said Lentz’s decision to skirt around controversial topics is dangerous.